General Description: The Brewerton Eared Triangle is one of four types in the Brewerton family of points. 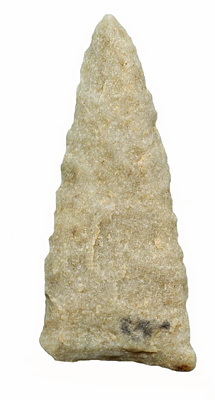 The Brewerton Eared Triangle is a small to medium sized, relatively thin, isosceles triangular bladed point with excurvate blade edges. It has no true stem but very slight indentations which resemble side notches that are just above small extending ears or auricles. The ears are usually well knapped in a delicately chipped manner and extend beyond the base. The base is usually concave and may be ground. When the point is held with the distal end pointing down the overall outline resembles a cow's head. 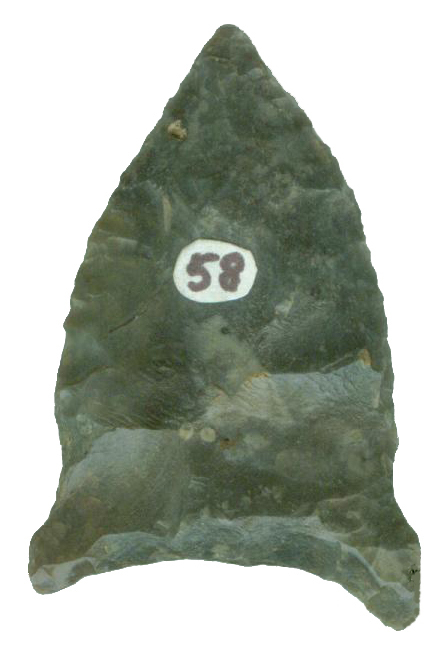 The Brewerton Eared Triangle is a minority or rare member of the Brewerton family comprising only 5.3% of the total point series recovered from the Robinson site. Ritchie suggests that the type integrates well with the Brewerton Eared-Notched type and may have developed from it. 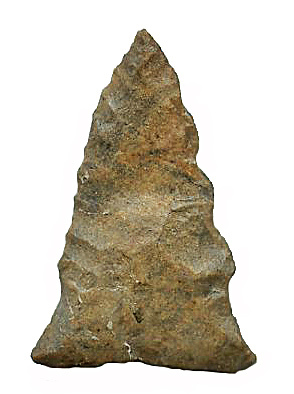 Most examples from the original Brewerton sites are made of local flints, carefully knapped by pressure flaking techniques. In southern New England the point can be made from local materials such as quartz, slate and siltstone. The Brewerton Eared Triangle is not commonly found and is rather a rare point in typical assemblages. However its primary distribution area is in New York, Massachusetts, Connecticut, Rhode Island, New Jersey and Pennsylvania. It is possibly found in very rare occurrences in Ohio, Indiana, Virginia, Kentucky, West Virginia and eastern Illinois. The size of the Brewerton Eared Triangle point can range from 22 mm to 55 mm in length with the typical point being in the 27 mm to 38 mm range. The point is usually one-half to two times as long as it is wide. Average thickness is 6 mm. The Brewerton Eared Triangle was named by William A. Ritchie for specimens found at the type sites in Brewerton, Oswego County, New York.